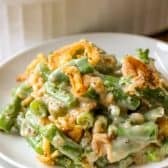 Tender green beans are tossed in a delicious creamy sauce, cheese, crispy onions, and baked with even more crispy onions until hot and bubbly. Combine soup, milk, soy sauce, pepper, green beans, 1 cup onions and cheese (if using) in a casserole dish. Bake uncovered for 30-35 minutes or bubbly. Remove from oven and stir. Top with remaining onions and return to oven for an additional 10 minutes or until golden.